If you do not know what it means, linguistic validation and cognitive debriefing may sound complicated and intimidating. Those in clinical research know that linguistic validation and cognitive debriefing are necessary for qualifying an instrument’s validity for use in multinational trials and protecting research data pools. Without linguistic validation and cognitive debriefing, clinical research trials are in danger of being rejected due to patient misunderstanding of poorly translated clinical instruments. The US Food and Drug Administration requires linguistic validation and cognitive debriefing to show content validity for all submitted translations. This blog will focus on explaining linguistic validation, and a future blog will further discuss cognitive debriefing. At its most basic level, linguistic validation is the process by which an instrument or patient questionnaire is simultaneously translated by different translators, both translations are reconciled into a single version and then that version is back-translated by other translators into the original language to evaluate the quality of the reconciled translation in comparison with the source document. 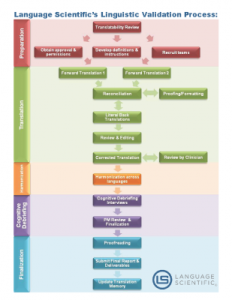 However, the full version of the linguistic validation process includes preparation, translation, reconciliation, harmonization, cognitive debriefing and finalization phases. Linguistic validation is most often used for Clinical Outcomes Assessments (COAs), such as Patient Reported Outcomes (PROs), Clinician Reported Outcomes (ClinROs) and Observer Reported Outcomes (ObsROs) and for Quality of Life (QOL) questionnaires. These are often called “instruments” and include instructions, items (also known as questions) and response categories or response choices to those items/questions. Linguistic validation is done to ensure that the translation states in the target language what the original in the source language intended. Linguistic validation goes beyond producing translations that have equivalence of meaning with the original source document; it provides equivalence of construct value of the instrument items for each culture. In other words, the translated questionnaire must behave statistically the same way across all languages. The ultimate goal of linguistic validation is to ensure that all components of the questionnaire have the same construct value and are conceptually equivalent across multiple languages and locales. Linguistic validation is an extra step to guarantee translation quality for high-value materials. The International Society for Pharmacoeconomics and Outcomes Research (ISPOR) has made recommendations as to how to properly conduct linguistic validation. When choosing a language service provider, it is most important to find one that follows ISPOR-compliant processes and methodologies. The first step in linguistic validation involves at least two independent translators who render the source material into the target language in a process called forward translation. Forward translations should be performed by experienced professional translators who are native language experts who also are specialists in the field of study (in fact, this should be true of all translators you hire). Your translators should be clinicians, doctors, psychiatrists, social workers or relevant established experts and not just individuals who are bilingual. The next step is to have the forward translations compared and reconciled into a version that combines the best of both forward translations. The reconciled version of the translations should be conceptually equivalent to the source. Transcreation may be more appropriate than a word-for-word exact translation. Sometimes an exact translation may result in unintended subtle shifts in meaning in the target language. The harmonized translation should be easy to understand in the colloquial language of the target audience. Next, the reconciled translation is then translated back into the original source language. The back translations should be performed by (at least) two independent, separate translators who have not seen the original source document or material. Once the back translations are complete, the project manager then reviews the back translations in light of the original source document and determines if the harmonized translation is accurate or linguistically valid alongside the original. At this stage the project manager, in-country investigator and/or translation team work together to produce the final corrected translation. Once this phase of linguistic validation is complete, typically one wants to test the validated instrument to ensure that respondents in the target locations interpret the items and responses in a manner that shows equivalence of meaning. This is typically done through cognitive debriefing, which we will discuss in an upcoming blog. Please like and share this blog with your friends and colleagues, and check back soon for the rest of the linguistic validation and cognitive debriefing process defined.